My paternal great-great-grandfather, José Cayetano de la Trinidad Huesca. Date unknown. The above photograph (or is it a drawing?) of my great-great-grandfather, José Cayetano de la Trinidad Huesca, holds pride of place on a wall in our home. Under his watchful gaze are photographs of his son, José Enrique Florentino Huesca, his grandson, José Alberto Cayetano Huesca, and his great-grandson – my father – Gilbert Cayetano Huesca, along with others of our extended family. My father received a 12″ x 24″ oval version of this portrait of Cayetano, as he was known, and another of his son, Enrique, from cousins during a visit to Jalapa, Veracruz, over thirty years ago. It may be a crayon enlargement, which was a technique used to enlarge a smaller photograph. It is hard to date the portrait, but based on his graying hair, and the fact that crayon enlargements were available beginning in the 1860s, I would estimate him to be at about 50 years old or more. His lively eyes and his slightly parted lips suggest he wants to share something with us – perhaps the wonder of witnessing the growth of his eight children, or the joy he felt as he finished some of the wood furnishings he crafted for the grand Cathedral Basilica of Puebla in his profession as a carpenter. Maybe he wants to share the insights he has learned about faith and family and life, insights into the wisdom and values that have flowed through the veins and permeated the conversations of subsequent Huesca generations to the present day. Most of all, his sparkling eyes and the kindness of his expression speak to me and make me wish I knew more about his life. If only I could go back in time and spend a day with him! 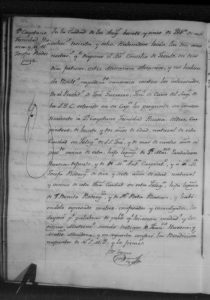 Below is the record of Cayetano’s marriage to my great-great-grandmother, María Josefa Rodríguez, in the City of Puebla, Mexico, on February 25, 1838. Marriage Record of José Calletano de la Trinidad Huesca and María Josefa Rodríguez, February 25, 1838, Puebla. over four years now a resident, legitimate son of Mr. Mariano Pantaleón Huesca, deceased, and of Maria Antonia Carpintero; and I heard Miss Josefa Rodríguez, age seventeen, a native of this city and parishioner, legitimate daughter of Mr. Benito Rodríguez and María Rita Rascón; and having heard them express their mutual consent, heard their confessions, and given them Communion, I deposed them, words which they made true and legitimate, the witnesses being Mr. Francisco Huesca (4), and Mariano Mendoza; thence I conferred upon them the Nuptial Blessings of Our Very Illustrious Lord. (1) City of Angels: the name for Puebla de los Angeles (Puebla of the Angels). (2) inter Missarum solemnia: (Latin) In the solemnity of the Mass. 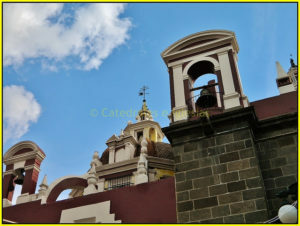 (3) The Sagrario Metropolitano, or Metropolitan Sanctuary, was a chapel of the Cathedral of Puebla, known as the Cathedral Basilica of Our Lady of the Immaculate Conception. Because of the Cathedral’s status as the See of the wider Archdiocese of Puebla, its interior was not intended for local parish functions. 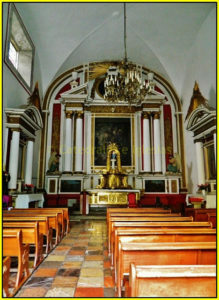 For this reason, the Sanctuary was used for spiritual observances and conferring the Sacraments on the local Creole-Spanish population. 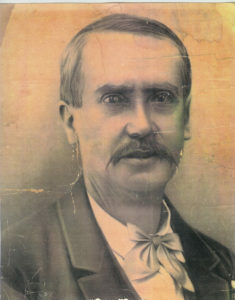 (4) Francisco Huesca: presumably Cayetano’s brother, Juan Francisco de la Luz Huesca. * With special thanks to my cousin, Enrique Huesca Fernández, for his assistance with this translation. previous Previous post: Happy Birthday, Mamma! I love how you use your description of Cayetano’s photograph to make him come alive with facts of his life! Thanks, Liz. Cayetano’s expression made it easy!